MOSCOW (Sputnik) - Syria remains at the heart of escalating tensions between Israel and Iran, and the exchange of accusations between the two nations during the week of the General Debate of the 73rd UN General Assembly (UNGA) clearly indicates that these sharp disagreements show no sign of abating, experts told Sputnik. On Thursday, Israeli Prime Minister Benjamin Netanyahu used the UN platform to announce that his country allegedly discovered Iran’s second secret atomic warehouse used to store nuclear-related material. The claims met a swift and harsh response from Tehran. Iranian Foreign Minister Mohammad Javad Zarif noted that these "revelations" had been meant to obfuscate what he called the fact that Israel was the only country with "secret" and "undeclared" nuclear weapons program, calling on Tel Aviv to disclose it to international inspectors. According to Joshua Pollack, a senior research associate from the Middlebury Institute of International Studies, the issue of Iranian military presence in Syria was a real "subtext" of Netanyahu's remarks. "As long as the Iranians have armed forces in Syria, and as long as they continue to support Hezbollah in Lebanon, the Israeli government will shine the harshest possible light on them in public forums like the UNGA," Pollack told Sputnik. Syrian lawmaker Ahmad Merhi similarly tied Netanyahu’s UNGA speech with the developments in Syria, suggesting, however, that it was an attempt to portray Israel as a victim amid the alleged Iranian threat coming from the neighboring country and somehow justify its own actions in Syria which led to the crash of the Russian Il-20 jet. "Netanyahu wants to push the world against Iran specifically after Israel’s incident with the Russian plane. He tries to justify their acts amid the plane incident. Netanyahu wanted to use the UN tribune to show that Israel is a victim in this situation. At the same time he was reiterating that his military operations in Syria will not stop," Merhi told Sputnik. Former Israeli Deputy National Security Adviser Eran Etzion listed a number of reasons showing that the current tensions would hardly de-escalate in the near future. First of all, the Israeli expert believes in the credibility of Netanyahu’s statements on Tehran’s alleged nuclear facilitates, noting that the US withdrawal from the Iran nuclear deal has only weakened the existing mechanisms to keep the Iran nuclear program under international control. Marco Zanni, a member of the European Parliament’s delegation for relations with Iran, shared the view, noting that "keeping the nuclear deal alive could be probably one of most effective ways to overcome current tensions." Secondly, Etzion pointed to the rising tensions in the Gaza Strip, which Israel blames on Israel-supported Palestinian forces and new looming package of the United States’ anti-Iran sanctions as factors not contributing to calming the disagreements down. Thirdly, he described Syria as the main issue of friction. 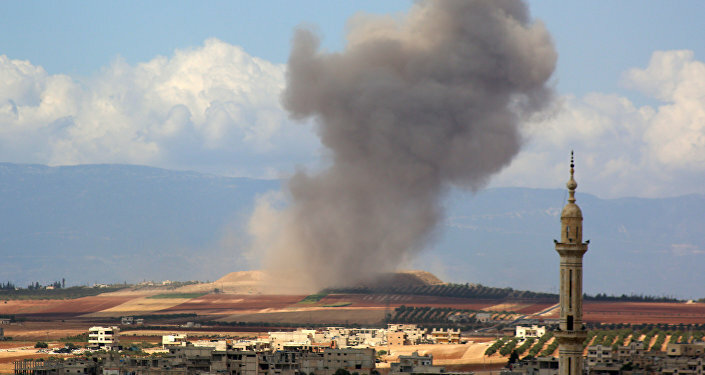 "Iran and Israel continue to march on a collision course, mainly in Syria. After the Il-20 tragic incident, and Russia’s possible policy change with respect to Israel’s activities against Iranian military assets in Syria, tensions will only intensify," Etzion said. Marco Zanni, a member of the European Parliament’s delegation for relations with Iran, shared the expert’s view that the de-escalation in the region was very unlikely. According to Zanni, Syria has become an extremely overcrowded theater of military actions, where interests of many players have come into conflict. "At this stage, I do not see any further development; they are at stake, taking into account the growing tensions in that area and the role played by outside actors such as the United States and Russia in the shifts in the Middle East balance of power," he suggested. Etzion stressed that Israel’s main concern was the future of Iranian military presence and its ceasefire agreement with Syria once the conflict in the Arab republic was over. "The most pressing issue is of course Syria. Israel demands that Iran withdraw completely from all Syrian territory. This will not happen. However, Israel has a legitimate concern, one that Russia should address. Now that the civil war is almost over, and Assad’s regime has retaken control, it is time to gradually reinstate a stable and agreed ceasefire between Israel and Syria," he pointed out. According to the expert, the 1974 Armistice agreement "must be upgraded to reflect the new circumstances, mainly Iran’s and its various proxies’ activities against Israel from Syria’s territory," noting that "Russia should be the main facilitator" of the process. While Syrian Foreign Minister Walid Muallem said on Saturday that the fight against terrorism in the country was almost over, the struggle still continues. Despite Damascus' protests, Israel too continues its operations in Syria, citing Iran's alleged military presence. On September 17, Israel's actions in Syria's airspace led to the crash of the Russian Il-20 plane. According to the Russian Defense Ministry, Israel had notified the Russian military of its airstrikes in Syria only one minute before their start and failed to provide the location of its bombers to Russia. As a result, the Il-20 was caught in the crossfire and downed by a missile launched by Syria's S-200 air defense system. The Russian Defense Ministry said Israeli F-16 jets flying in the vicinity used the Russian aircraft as a shield against Syrian air defenses, with Israel refuting the accusations of using the aircraft as a shield and maintaining that Moscow was warned about the air raid in a timely manner.